I did not plan/expect/intend to run the California International Marathon in 2014. This summer, I trained harder than I ever have in my life, for the Berlin Marathon. In a 19 week period leading up to the marathon, I ran about 1400 miles. At Berlin I ended up with a 3 second PR. I ran a strong race. It felt great to be rushing through the Brandenburg gate at sub-7 pace. I had failed twice before at Berlin (a DNS in 2011 and a 3:39 in 2013). It felt good to have that monkey off my back. However, considering how hard I trained, I expected better!! Running a well-organized US marathon vs a spartan international race would be a welcome change. December 7th, at 10 weeks from Berlin is kind of an optimum date, given that I leave for South America the week after the race. CIM had already filled up but they had some slots for a qualifying time (which for me would require a 3:20 marathon). I registered. Running two all-out marathons so close by would be a risk for sure. Something I had never pulled off successfully. I never had back-back PRs in marathons. My primary goal in the ensuing period was to maintain fitness, rather than attain fitness. I had trained for a pancake flat Berlin course. I needed to add hill work, specifically downhill training to navigate the CIM terrain. As planned, I took 2 weeks off after Berlin. In the next 8 weeks I put in a total of 492.2 miles, peaking at a 76.5 mile week. I also didn't take any rest days. Taking 3 days off in the week before Berlin (after having a run streak of around 100 days) seemed to have induced a weird response from my body. I had a 20 miles long run and an impromptu marathon run (In Unity We Run marathon - 3:21). It wasn't until 6 weeks after Berlin that I felt any sort of zing back in my legs. My legs had felt dead. All my training runs for Berlin were at sub-8 pace, here I was consistently going above 8 min/mile pace. To be fair, I was running hillier routes and the weather was bad. I didn't get in any track workouts and had minimal tempo-ish runs. My key workout was repeats on a 0.75 mile hill which gained about 350 feet. I included this hill for most of my runs. I also tried to run the downhills aggressively. 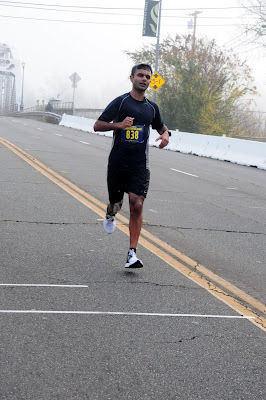 A week before the race I paced the second half of the Seattle marathon (3:25 pace). The last 10k of the marathon is pretty hilly. The weather for the marathon was in the 20Fs. The weather in November was challenging to say the least - we had alternating cold, windy and sunny spells alternating with warm, rainy and windy spells. CIM has some extreme weather in 2012 and 2013. I was unwillingly conditioned for the worst. Going into the race it was looking very unlikely that I would get any of these goals. Even running at a 7:30 pace was proving to be difficult. Before Berlin, MP seemed easy, almost effortless... I chose to be in denial. I hoped that a combination of the predicted perfect running weather and the fast course would weave it's magic... Somehow... I had been in denial before. In 2011, I got to the start line of Berlin with a sfx before realizing that I wouldn't be able to finish a mile leave alone finish a marathon. At both Paris and Berlin this year... I missed my sleeping on my own bed. I missed being able to fuel on palatable food. Therefore, I intended leave for Sacramento as late as possible, on a 11:15 am flight on Saturday. I reach the expo at 2:30 pm, straight from the airport. It was a small expo so I didn't need to spend much time there. While arranging my stuff for the race, I realized that I had lost my pins. I had flashbacks of Paris 2011, where I was desperately trying to communicate to folks 30 minutes before the race start that I needed safety pins. Thankfully, there was no language barrier here and I could rush back to the expo while it was still open to get some more pins. At 9 pm, I decided to have a second dinner - two massive plates of rice. Fueling before a marathon is important I was told :p I then had a heart-heart FB chat with a kind sole from my running group about how hopeless my en-devour the next day was, while he tried hard to motivate me... Then I slept. I slept well. I felt horrible during the bus ride. A muscle in my stomach was sore. I think that was because I ate about 3-4 days worth of food in the previous day. As I got of the bus, I remarked to the runner next to me - "All I want to do now is go back home and sleep." He responded - "Dude, you're the most pessimistic runner I've ever met." It was cool that they had so many porta-potties at the start. It actually meant that unlike Paris and Berlin, I could actually use one of them before the race started. As I waited on the porta-potty line, I observed the pre-race rituals of runners. I think if aliens descended on Planet Earth, even the smartest of them would fail to explain why we runners do what we do. I lined up next to the 3:05 sign. There were a lot of fast looking people hanging out there... The mayor of Folsom mentioned how we had perfect running conditions today. He was right - 50-51F at the start and 56F at the finish. There was to be a decent cloud cover though the humidity was a tad on the higher side. I had considered running with a Tazz pace band for 3:05 but it just seemed to be too complex. I just decided to run as I normally do. Go by feel and how my legs felt. The first mile was largely downhill. The 3:05 pace group had gone out ahead of me. I was not too overly concerned because in my head I would be fine if stayed at 3:08 pace, which was around about a 7:10 pace. Hmmm... 6:55. Perhaps because it was a downhill mile. I'd slow down soon for sure! I did NOT want to go out too fast. I had been warned to expect rolling hills so I was not surprised by the inclines. My calfs felt a bit tight and my PF was hurting. I was also a bit hyper-sensitive because I was wearing a pair of New Balance test shoes, on which I just had four three mile runs. That was definitely a risk but it was my best option since I had been training on a pair of Nike test shoes which had too many miles on them. I've had similar aches previously in marathons during the firs 3 miles but they'd clear up by mile 6. I was hoping for a repeat here. My first Cliff Shot. I typically target having one every four miles and six in all. At the water-stops, I either went with Nuun or Shots + water. I was right in front of the 3:05 pace group at this point. I heard the pacer say - "5 miles in 35 minutes. Right on track folks." Each time we'd pass spectators they'd cheer for the 3:05 group. Gradually those pace group cheers disappeared. I took that to mean that I had moved well ahead of the pace group. It was cool that the mile markers were spot on! I think there were only 5-6 markers during the race which weren't in sync with my GPS. That is rare in a marathon and a testament to how fast and well-organized this race actually is. It was a mental win to pass the one hour mark!! I did some basic math and realized that I had a shot at getting past my half marathon PR. I was not sure if that was a good or a bad thing :-| Usually, I read marathon reports where folks follow the statement - "I set my half marathon PR" with the statement - "and then I crashed and burnt." This was a new 40 second half marathon PR for me. I went past my run at the Scotiabank Vancouver half (a very fast course) in 2011. I saw Anu here which was unexpected since I though Pam and her were going to hang out at the finish line. This is around the time in a run that I start playing with mental targets - "less than 10 miles, 2/3rds done...". Two hours of running done. I was still feeling pretty good, especially my quads were doing just fine. I'd have to believe that my rudimentary "hill training" in the last month proved to be effective. I did see some relay runners in the midst. 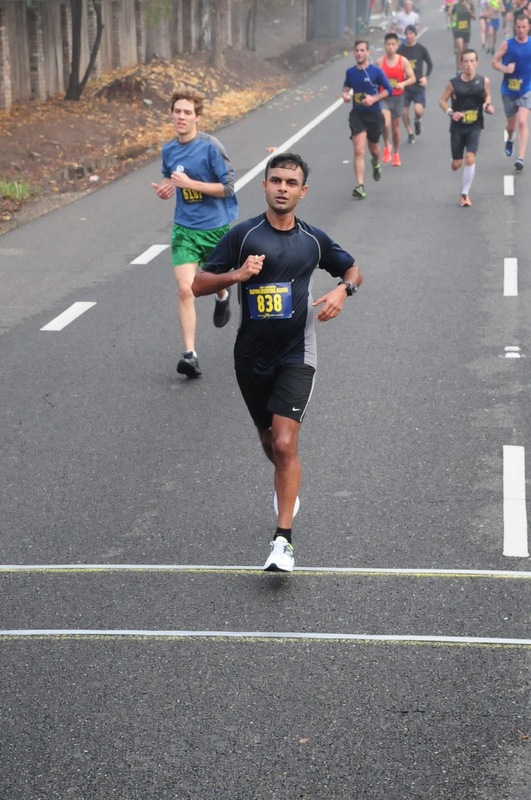 I told myself - "You know what, for the most part I was running stronger than them :p"
The last 10k is a lot flatter than the rest of the course. I don't think I was slowing down significantly but just expending more or less even effort. My GPS lost signal for a bit which was a tad irritating. 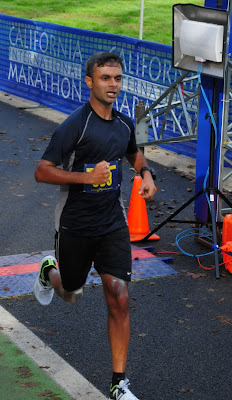 I saw Anu at the 26 marker (which I'd have to say was impressive spectating). I crossed the finish with a smile. As I crossed the finish line I heard the announcer say - "All these runners crossing the line now have qualified for Boston!". After all 3:05 is the young dudes' BQ time. I usually feel horrible after I've reached the finish of a marathon and stopped running. Today I felt surprisingly good. I saw the water bottles and the mylar blankets but didn't feel I needed them. 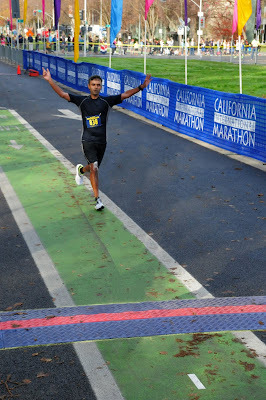 I hung out at the finish line for a moment to soak it in. The medical volunteer must have thought I was in shock. She asked me if I was OK. It told her - "Absolutely, I'm just chillin'". She then asked me if I needed the mylar blankets to stop the chillin'. I explained to the poor lady that this was the other kind of chilling... At this point she must have been convinced that I lost it but there was nothing she could do. I noticed that there was foamy laundry detergent flowing down my legs. Clearly the rinse cycle of my washing machine had not been very effective. Oh well. At the food tent the volunteer remarked - "You know what, most of the runners passing by have seemed so miserable but you just seem so happy!". I mentioned - "Yes, I am." I was beaming, which is kind of rare for a reserved sole like me. This is the first marathon, of the 33 I've run, that I am completely satisfied with - I wanted nothing more. If I could roll back time, I'd wish that the race, for me, would go exactly the way it went. I'm also am at peace with myself. If time froze at this moment, I'd be able to look back, and be satisfied. This is was my tenth year of running and also my best year. I ran my fastest (CIM: 3:03), second fastest (Berlin: 3:09), fourth fastest (Paris: 3:11) and eight fastest (In Unity We Run: 3:21) marathons. I paced three marathons (ran halves) - North Olympic Discovery, Skagit Flats and Seattle. I tested four shoes (two for Nike and two for New Balance). I ran every day in the year (some doubles) barring 2*two weeks of planned downtime, my cousin's wedding day and now some days for a planned vacation. The turning point for me was four weeks before Berlin 2013... I was set to run yet another marathon where I would be struggling to the finish. I pledged that I would not run another marathon till I was well-trained. I was becoming old and I had a limited amount of time to run as fast as I possibly could. I would no longer run marathons on esoteric courses. I would stay focused and not over-race. Fitness-wise, the turning point came after a four week hiking trip, all at over 10,000 ft altitude, in Peru and Bolivia. That included two tough Inca trails. The Incas must have been in great shape! When I returned to Seattle, I discovered an inordinate amount of oxygen, at sea level. Running felt easy and I was determined not to waste this new found fitness. My running group has a weekly newsletter where they occasionally profile an inspirational runner. One week, they profiled this amazingly fast 60 year old runner. He mentioned that his greatest regret was not running faster courses, when he was young. That was along the lines of what I was thinking. "I just hope to run for as long as I can and to make the most out of it for as long as I can. When or if I am not able to run at some point down the road then atleast I can look back and know that when I could I gave it my all."